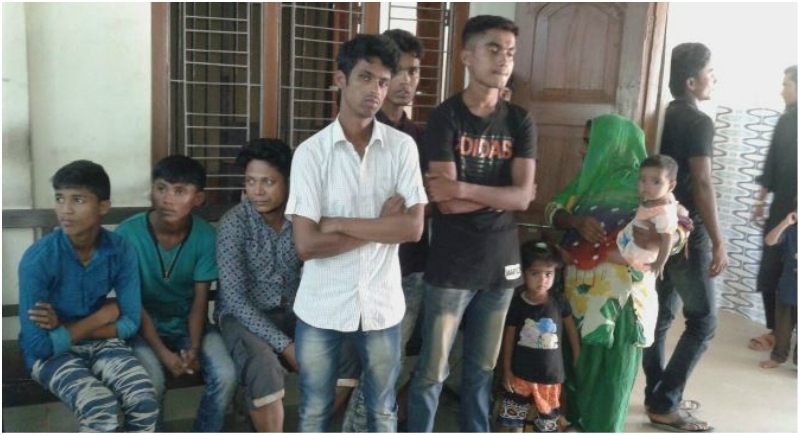 Khowai, April 20: While the nation is boiling amidst the ‘Rohingya Muslim’s threat’, around 18 Rohingya refugees were arrested from Khowai district of Tripura. The refugees were arrested for entering illegally who were escaped from camps in Bangladesh heading to New Delhi. Superintendent of Police (Khowai district) Krishnendu Chakravertty said that acting on a tip-off, police raided a Guwahati-bound bus and arrested the refugees including 11 men, three women, and four children. "They came from Chittagong in neighbouring Bangladesh, but it is not clear which route they followed because they were giving confusing statements. However, they said that they are Rohingya refugees and were going to Vikashnagar in Delhi in search of jobs, where many other Rohingyas were staying," the SP said. On January 14 this year, 6 Rohingya refugees were arrested from Dharmanagar railway station in North Tripura district. Eight others were arrested from Khayerpur market area in West Tripura district, 10 Km from Agartala city, on November 29 last year. According to police, Rohingya refugees often sneak through Tripura to enter Indian soil. The Ministry of Home Affairs had asked the Tripura government last October to identify and monitor Rohingya refugees. The ministry said that infiltration of Rohingyas from the Rakhine State of Myanmar into Indian Territory is a burden on the limited resources of the country. Security challenges to the country are also aggravated by this influx, it said. Myanmar"s military Junta regime cancelled nationality of Rohingya Muslims as per provisions of the Myanmar Citizenship Law, 1982. Many have since fled the county and lakhs are housed at refugee camps in Bangladesh. Several have taken shelter in India. Over 670,000 Rohingyas have fled the northwestern province of Rakhine since the end of August last year after a wave of persecution and violence that the United Nations described as an attempt at "ethnic cleansing". Efforts are on to deport them to their homeland in Myanmar. Border Security Force (BSF) Tripura Frontier Inspector General S.R. Ojha said that since 2015, many Rohingyas entered Tripura and other northeastern states via Bangladesh. Other than Tripura, the other states sharing the 1,880-km international border with Bangladesh are Meghalaya (443 km), Mizoram (318 km) and Assam (263 km).